The indications for non-emergent operations during pregnancy remain undefined. Many surgeons defer non-emergent operations until after delivery to minimize fetal risk. We wished to determine the outcome of delaying cholecystectomy in pregnant patients hospitalized for non-acute gallbladder disease. After approval from the Institutional Review Board, a retrospective case review was performed at a large volume regional referral center for high-risk obstetrics. Data was collected on 58 pregnant inpatients from 11/03 to 11/06 who were diagnosed by a general surgeon with symptomatic cholelithiasis, choledocholithiasis, gallstone pancreatitis, biliary dyskinesia, or chronic cholecystitis. Thirty-nine patients who were observed for gallbladder disease were compared with 19 who underwent cholecystectomy during pregnancy. Patients who were observed during pregnancy had a higher rate of pregnancy-related complications (36% vs. 18%). 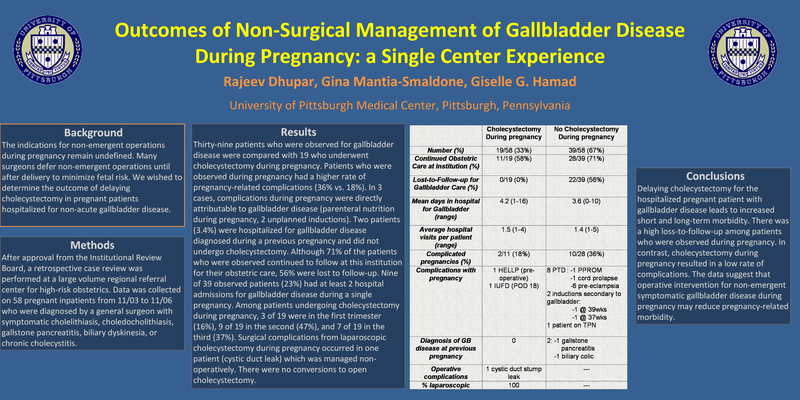 In 3 cases, complications during pregnancy were directly attributable to gallbladder disease (parenteral nutrition during pregnancy, 2 unplanned inductions). Two patients (3.4%) were hospitalized for gallbladder disease diagnosed during a previous pregnancy and did not undergo cholecystectomy. Although 71% of the patients who were observed continued to follow at this institution for their obstetric care, 56% were lost to follow-up. Nine of 39 observed patients (23%) had at least 2 hospital admissions for gallbladder disease during a single pregnancy. Among patients undergoing cholecystectomy during pregnancy, 3 of 19 were in the first trimester (16%), 9 of 19 in the second (47%), and 7 of 19 in the third (37%). Surgical complications from laparoscopic cholecystectomy during pregnancy occurred in one patient (cystic duct leak) which was managed non-operatively. There were no conversions to open cholecystectomy. Delaying cholecystectomy for the hospitalized pregnant patient with gallbladder disease leads to increased short and long-term morbidity. There was a high loss-to-follow-up among patients who were observed during pregnancy. In contrast, cholecystectomy during pregnancy resulted in a low rate of complications. The data suggest that operative intervention for non-emergent symptomatic gallbladder disease during pregnancy may reduce pregnancy-related morbidity.